Anyone who is aware of the history of the Armenian Genocide has heard the name of Enver Pasha as one of its key executors. Unlike its mastermind, Talaat, Ismail Enver Pasha was a military officer, born in Constantinople on November 22, 1881. He studied in different military schools and graduated in 1903 with distinction. In 1906 he was sent to the Third Army, stationed in Salonica. He became a member of the Committee of Union and Progress (CUP) during his service. When the Young Turk coup broke out in June 1908, Enver became one of its military leaders. He was actively involved in the suppression of the attempt of countercoup of April 1909, which tried to restore Abdul Hamid’s absolute powers. Afterwards, he was sent to Berlin as a military attaché, where he strengthened the ties between German and Ottoman military. During the Italo-Turkish war of 1911, Enver left Berlin and organized the defense of Libya, where he was appointed governor of Benghazi. He was called back to Constantinople when the First Balkan War started in October 1912 and ascended to the grade of lieutenant colonel. In the same year, the CUP fell from government and was replaced by the Liberal Union party. However, the severe Ottoman defeat in the First Balkan War weakened the government and Enver organized a coup in January 1913. The power returned to the CUP and the triumvirate formed by Enver, Talaat, and Jemal Pasha took charge until the end of World War I. Enver became Minister of War and married into the royal family. When in June 1913 the Second Balkan War broke out, he reversed some of the losses by recapturing Adrianople (nowadays Edirne) from the Bulgarians. Enver was an architect of the Ottoman-German alliance in World War I, expecting a quick victory that would benefit the empire. He assumed command of the Ottoman forces in the Caucasus. Pursuing his quest for a Pan-Turkic empire stretching to Central Asia, he wanted to force the Russians out and take back Kars and Batum, which had been ceded after the Russo-Turkish war of 1877-1878. His offensive in the thick of winter ended with a catastrophic defeat at the Battle of Sarikamish in December 1914 – January 1915 and tens of thousands of Turkish soldiers dying in the subsequent retreat. On his return to Constantinople, Enver blamed his failure on his Armenian soldiers, although in January 1915 an Armenian soldier had carried him through battle lines on his back and saved his life, and a letter written by Enver himself to the Prelate of Konia, Bishop Karekin Khachadourian, praised the Armenians for their bravery and faithfulness in February 1915. Enver played a major role in the Armenian Genocide. He took the first steps by ordering the Armenian recruits in the Ottoman army to be disarmed and reassigned to labor battalions before their summary executions. These instructions were explained on the basis of accusations of treasonous activity, but the defeat of his army only provided the pretext for escalating a campaign of extermination that was also unleashed against the civilian population with the use of the secret paramilitary Special Organization (Teshkilât-i-Mahsusa) to systematically massacre deported Armenians. After the collapse of the Russian front in 1918, the Ottoman armies advanced into the Caucasus. The Third Army, commanded by Vehib Pasha, entered the territory of Eastern Armenia, and was halted at the battles of Sardarabad, Bash Aparan, and Gharakilise in May 1918. A new military force called the Army of Islam, commanded by Enver’s half-brother Nuri, advanced towards the territory of today’s Azerbaijan and, in combination with the Tatars (Azerbaijanis), occupied Baku on September 15, organizing a massacre of the local Armenian population. However, the Ottoman Empire was faced with defeat. Enver was dismissed from his ministerial position in October 1918, and a month later he fled into exile together with other CUP members. Tried in absentia by a postwar courts-martial for crimes of “plunging the country into war without a legitimate reason, forced deportation of Armenians, and leaving the country without permission,” he was condemned to death in July 1919. Enver first went to Germany, and shuttled back and forth between Berlin and Moscow trying to build a German-Soviet alliance. He went to Baku in September 1920 and took part in the Congress of Eastern Peoples. In July 1921 he tried to return to Turkey, but Mustafa Kemal did not want him among his forces, as he explicitly rejected Enver’s Pan-Turkic ideas. He traveled to Moscow where he managed to win the trust of the Soviet authorities. In November 1921 he was sent by Lenin to Bukhara, in Turkestan, to help suppress a revolt against the local Bolshevik regime. Instead, along with a small number of followers, he defected to the rebels and united their different groups under his own command to fight against the Red Army. On August 4, 1922, a cavalry brigade of the Red Army under the command of Hakob Melkumian (known in Russian sources as Yakov Melkumov) launched a surprise attack over Enver’s headquarters near the village of Ab-i-Derya. The attack ended with Enver’s death. There are different versions. According to Melkumov’s memoirs, Enver managed to escape on horseback and hid for several days in the village of Chaghan. After the hideout was located, the Soviet troops stormed the village and Enver was killed by Melkumov himself in the ensuing combat. Enver’s body was buried near Ab-i-Derya. As it happened with Talaat in 1943, the remains of this executioner of the Armenian people were brought to Turkey in 1996 and reburied at the Monument of Liberty cemetery in Shishli, Istanbul. The alignment of the Ottoman Empire with the Central Powers (Germany and Austria-Hungary) and its declaration of war against Russia brought inevitably a winter campaign in the Caucasus. Russia had taken Kars during the Russo-Turkish War in 1877 and feared a campaign aimed at retaking Kars and the port of Batum in Georgia. An initial Russian offensive in the first half of November was stopped 25 kilometers inside Turkish territory along the Erzerum-Sarikamish axis. 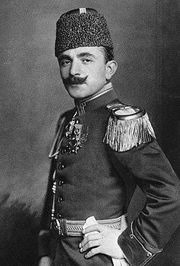 War Minister Enver Pasha devised an operation plan and decided to take personal charge and execute his plan through a winter offense. The Turkish Third Army included 83,000 regular troops, reserves, and personnel of the Erzerum fortress added to 118,000. The Russian Caucasus Army was a well-equipped 100,000 troops. It included two battalions of Armenian volunteers, commanded by Hamazasp (Servantzdian) and Keri. The Turkish plan was two-step: a sudden initial attack and a second step with two corps (Ninth and Tenth) of the army proceeding at full speed. After a very hard march under heavy snow in the mountainous territory, and various delays, the Turkish army started its attack on Sarikamish on December 29, instead of December 25 as planned. The troops were worn out, half-starved, and short of guns and ammunition. Enver thought that the Russians, who had initially evacuated Sarikamish, were retreating to Kars, when they were actually executing an encircling movement. The IX and X Turkish Corps, totaling 12,000 men, began to attack Sarikamish. At the end of the day, they were driven off, losing 6,000 troops. Enver’s positive mood was replaced with disappointment when he received information that the Russians were preparing to encircle his forces with a force of five regiments. On January 1, the commander of the XI Corps pressed a frontal attack on Sarikamish lasting for the next 4 days; after that the heavy fighting began to lose momentum. Snow hindered advancing forces which were supposed to bring the relief. On January 2, Russian artillery fire caused severe casualties. Enver Pasha received two reports; both were saying that they did not have any capacity to launch another attack. The Russians were advancing now and the circle was getting narrower. 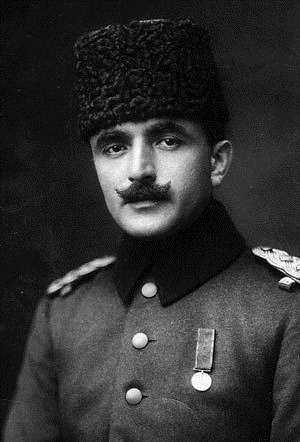 On January 4, Turkish Brigadier General Hafız Hakkı Pasha toured the front line and saw that the fight was over. Afterwards, Turkish divisions started to surrender. Hafız Hakkı ordered a total retreat on January 7. The Ottoman Third Army started with 118,000 fighting power and was reduced to 42,000 effectives in January 1915. Russian losses were 16,000 killed in action and 12,000 who died of sickness, mostly due to frostbite. Enver was the strategist of the operation and the failure was blamed on him. Beyond his faulty estimate on how the encircled Russians would react, his failure was on not keeping operational reserves that matched the needs of the conditions. He did not have enough field service to factor the hardships faced by the soldiers and analyzed the operational necessities theoretically rather than contextually. Carrying out a military plan in the winter was not the major failure of the operation, but the level of its execution. The Armenian detachment units are credited no small measure of the success which attended by the Russian forces, as they were natives of the region, adjusted to the climatic conditions, familiar with every road and mountain path, and had real incentive to fierce and resolute combat. On his return to Constantinople, Enver Pasha blamed his failure on the actions of the local Armenians, initiating the repressive measures against the empire’s Armenian population that were an early stage of the Armenian Genocide. In the history and the mythology of the October Revolution and the Soviet civil war, the 26 Baku Commissars have played a role similar to the 300 Spartans in the history of ancient Greece. Their death would be immortalized in Soviet times through movies, books, artwork, stamps, and public works, and even cities and towns would be named after some of them. After the Bolshevik revolution of October/November 1917, a Soviet (council) of workers, villagers, and soldiers was created in Baku. This council came to power from April 13 to July 25, 1918 and created an executive organ, the Council of Popular Commissars, formed by an alliance of Bolsheviks and leftist Socialist Revolutionaries, and presided by a famous Bolshevik revolutionary, the Armenian Stepan Shahumian. It was known as the Commune of Baku. 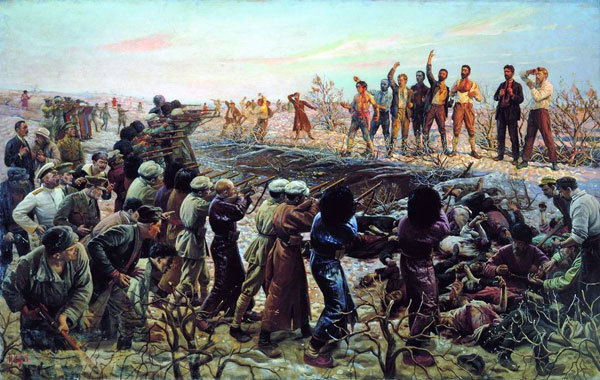 Isaak Brodsky’s The Execution of the Twenty Six Baku Commissars (1925) depicting the Soviet view of the execution. The Commune faced various problems, from the shortage of food and supplies to the threat posed by the invading Turks. 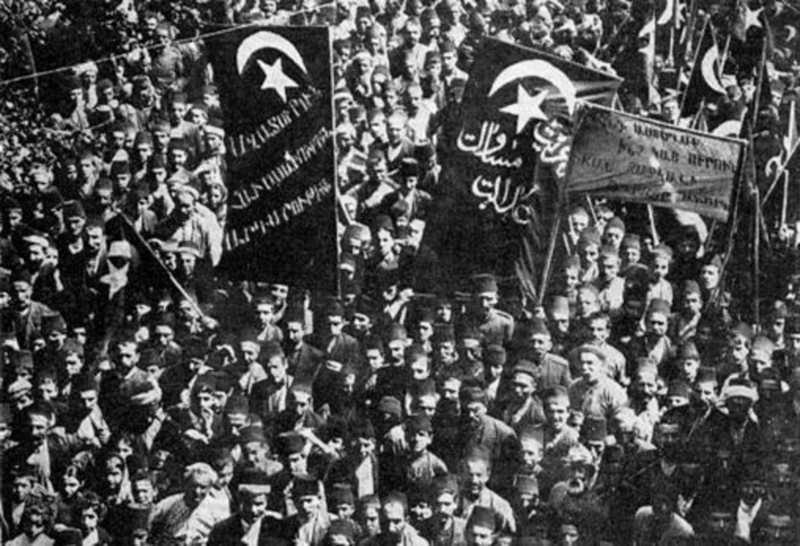 The Red Army units hurriedly organized by the Commune were defeated by the Islamic Army of the Caucasus, an Ottoman army unit organized by order of Minister of War Enver Pasha on the basis of the local Tatar (Azerbaijani) population, and retreated to Baku in July 1918. The military defeat provoked the rise of a coalition of rightist Socialist Revolutionaries, Social Democrats, and Armenian Revolutionary Federation members, which asked help from British forces stationed in Persia to counterbalance the Ottoman advance. The Commune transferred power to the new provisional government formed by the coalition, called the Centro-Caspian Dictatorship, and left Baku for Astrakhan, which was under Bolshevik control. However, the new authorities arrested the members of the Commune under charges of embezzlement and treason. However, a new attack of the Ottoman forces over Baku prevented the trial of the military tribunal, and, according to Soviet historiography, on 14 September 1918, during the fall of Baku to the Turks, Red Army soldiers broke into their prison and freed the 26 prisoners; they then boarded a ship to Astrakhan, which changed its destination to Krasnovodsk, on the other side of the Caspian Sea. They were promptly arrested by local authorities of the Transcaspian provisional government, also anti-Soviet, on September 17, and three days later executed by a firing squad between the stations of Pereval and Akhcha-Kuyma on the Transcaspian Railway, apparently under British pressure. Although they have been named as “commissars,” not all of them were officials and not all of them were Bolsheviks. Among the executed men, there were Russians, Jews, Armenians, Georgians, Azerbaijanis, Greeks, and Latvians. Along with Shahumian, there were five other Armenians: Baghdasar Avagian, military commander of Baku; Aram Kostandian, deputy commissar for Agriculture; Suren Osipian, chief editor of the newspaper Izvestia of the Baku Commune; Arsen Amirian, chief editor of the newspaper Bakinski rabochi; and Tadeos Amirian, commander of a cavalry unit. Arsen and Tadeos Amirian were brothers, and this explains why the latter, a member of the Armenian Revolutionary Federation, had fought on the side of the Commune. After the establishment of the Soviet regime, the authorities of Azerbaijan exhumed the bodies of the 26 victims and reburied them in Baku, at the square named after them, where a pantheon was built in 1968. The anti-Armenian hysteria in Azerbaijan has reached the point that, in January 2009 the pantheon was demolished, since the activity of the Baku Commune is considered an “Armenian conspiracy,” and the remnants were reburied at the Hovsan cemetery, reportedly “with the participation of Muslim, Christian, and Jewish clergy, and the corresponding rituals” (ironically, most of the commissars were atheists). Monuments and streets devoted to the commissars, whether Armenian, Russian, Georgian, or Azerbaijani, have also been demolished or renamed. Meanwhile, the cities of Stepanakert (in Gharabagh) and Stepanavan (in Lori) continue to carry the name of Stepan Shahumian, whose statue in the proximities of Republic Square, in Yerevan, has been maintained. Amirian Street, an important street originating from the same square, has also kept its name. The Russian revolution of November 1917 that set the grounds for the Soviet Union was followed by a civil war. Bolshevik troops were sent into Central Asia to establish Soviet power in 1919-1920. A local movement headed by Muslim elements, known as the Basmachi revolt (the Turkic word basmachi originally meant “bandit”), took advantage of the blunders of the Soviet government in Tashkent (the current capital of Uzbekistan) to challenge its authority and set a movement of national liberation. Enver Pasha, former Ministry of War of the Ottoman Empire and one of the main perpetrators of the Armenian Genocide, had become a fugitive of justice after his condemnation to death in absentia by the Ottoman court-martial in July 1919. He had first left Constantinople for Berlin in late 1918 and in 1919 had gone to Moscow, where he engaged in pro-Turkish activities among the Bolsheviks. After participating in the Congress of Eastern Peoples of Baku (September 1920), he tried to reenter Anatolia in 1921, but was rejected by Mustafa Kemal. Operation Nemesis had succeeded in the liquidation of several of Enver’s colleagues in European capitals. An Armenian group assassinated Ahmed Djemal Pasha on July 25, 1922, in Tiflis under the very sight of the Cheka, the Soviet secret police. Ten days later, Enver would find his own Armenian nemesis in Central Asia. 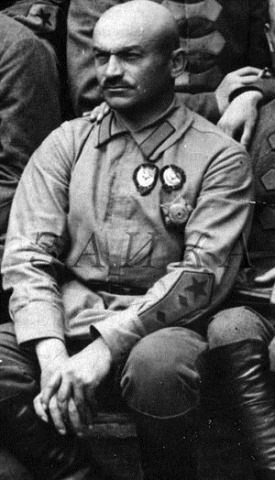 Yakov Melkumov (Hakob Melkumian), born in Shushi (Gharabagh) in 1885, was a decorated career officer who had participated in World War I and after the revolution had entered the Red Army. After fighting in Bielorrusia (Belarus) in 1918, he became a cavalry brigade commander in Turkestan in late 1919, and from 1920-1923 he was involved in the suppression of the Basmachi revolt. On August 4, 1922 Melkumian’s brigade launched a surprise attack while Enver had allowed his troops to celebrate the Kurban Bayrami holiday, retaining a 30-men guard at his headquarters near the village of Ab-i-Derya, near Dushanbe. Some Turkish sources claimed that Enver and his men charged the approaching troops, and the Turkish leader was killed by machine-gun fire. Melkumian published his memoirs in 1960, where he stated that Enver had managed to escape on horseback and hid for four days in the village of Chaghan. A Red Army officer infiltrated the village in disguise and located his hideout, after which the troops stormed Chaghan, and Melkumian himself killed Enver in the ensuing combat. After seven decades in Ab-i-Derya, Enver’s remains were taken to Turkey in 1996 and buried at the Monument of Liberty cemetery in Istanbul. Melkumian was decorated with the second order of the Red Army for killing Enver and defeating his forces. The Armenian officer continued his military career until 1937 in Central Asia. He was arrested in June 1937, during the heyday of the Stalinist purges, and charged with participated in the “military-fascist conspiracy.” He was sentenced to 15 years in prison and 5 years of deprivation of civil rights. After the death of Stalin, he was freed in 1954 and rehabilitated. He died in Moscow in 1962. The Nemesis Operation, approved by the Armenian Revolutionary Federation in its 9th World Assembly, held in Yerevan in September-October 1919, had a long list of Turkish leaders responsible for the Armenian Genocide among its targets. One of them was Ahmed Jemal, minister of Marine of the Ottoman Empire and member of the leading triumvirate of the Committee of Union and Progress (Ittihad), together with Talaat, minister of Interior, and Enver, minister of War. Jemal had taken the command of the IV Ottoman Army, based in Syria, and had overseen the execution of the second phase of the genocide, when the survivors of the caravans of deportees were dispatched and killed in the camps along the Euphrates River. He had also been in charge of the assimilation of Armenian orphans. Some targets of the operation, such as Talaat and former grand vizier Said Halim, Behaeddin Shakir (leader of the Special Organization) and Jemal Azmi (the “monster of Trebizond”), had been liquidated in Berlin and Rome, under the supervision of the special body created by the A.R.F. (Enver would be killed by a Bolshevik Armenian in August 1922, in Central Asia.) 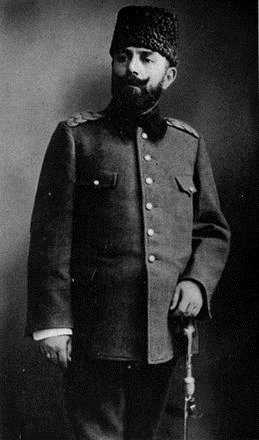 Jemal Pasha was also in Berlin, but had been able to avoid the Armenian avengers. “Djemal Pasha, former Minister of Marine in the Turkish Unionist Government, Chief of Staff of the Afghan Army, has been assassinated here. Two Armenians are charged with the crime. Little is known about the details of the operation. The name of Stepan Dzaghigian (who would later die in Siberia, exiled during the Stalinist purges) has been mentioned as one of the executors, helped by Petros Ter Poghosian and Ardashes Gevorgian. A fourth name, Zareh Melik-Shahnazarian, has also been mentioned as their collaborator in the last years, with the archives still waiting to yield their secrets.